Yeah...I thought there was something a little sinister about the 200+K views. new just about every week in regards to the authorship question. on my own little planet but I guess that can't be helped. I looked up quotes for self-delusion and found this by The Bard. I can't grok English of that period very well, so I'm not certain this quote actually applies, but it sounds impressive as hell, don't it? We've had a very uncomfortable Spring this year, with mostly cool weather interrupted by all too few warm days. Jus' sayin' to, you know, keep the post on topic. It's interesting--I feel like my recent disasters are actually counter to celestial intentions, and instead due solely to knaves and drunkards. Probably treachers too, but I'm not sure what those are. Speaking of the weather, I've got a little question regarding sunlight and solar panels. To make it short, my wife and I may be leaving Russia soon, not to come back to Scotland, but to go to Greece, where we're planning to buy a house and work from there. However, we'd like to make it as autonomous as possible, and are thus planning to find something with a yard to grow vegetables and have a chicken pen, and to put solar panels on it in order to produce by ourselves as much power and food as possible. Right now, what we're looking at is this house ; it's quite big, but it's a single storey building and thus has lots of space on the roof for solar panels. Moreover, there's already a solar water heater, the house is made of stone and is thus naturally insulated, and for the winter, there's a fireplace... And the country's not that cold anyways. Well, the amount of Sun is fine. In places like that, you're going to be limited by storage, not sunlight. It comes down to how many batteries you want to invest in, and the size of inverter you select. If the house is already attached to the power grid, I'd recommend leaving it. That way you can always fall back onto grid power if you have a problem or in the unlikely event you have a long period without much sun. You'll want to choose your electric appliances carefully, and the A/C is a definite problem. If possible, replace it with an evaporative cooler or some kind of alternative cooling system. I have inlaws living in a similar house on Crete, and over recent years the summers have become increasingly brutal. But air conditioners, like electric heating elements, are not friendly to completely off-grid electrical systems. It's already improving, with Li-ion batteries starting to be a viable alternative to lead acid. Still, it's expensive. I think it's going to be a while yet until we can start running things like heating elements and air conditioners off of batteries, at least economically. I'm currently designing a completely off grid house. We probably won't be adding the full PV system for another two years. I hope there is a big boost in technology by then, but I'm guessing that's not going to happen. You doing anything interesting with the exterior walls? Or just normal/traditional materials? Not very typical for most American houses. Still working out the details, but the exterior walls will likely be made of thick hollow styrofoam blocks that are backfilled with rebar and concrete. No wood framing, no wood on any exterior finish or trim. Roof will be metal or stone. You guys are awesome, I've never had such a rain of relevant advice whenever I asked for something on the internet! That will help me a lot, I'm really grateful. Regarding li-ion batteries, I'm used to the technology since I'm already using these for different applications (airsoft, mostly). KING LEAR: Blow, winds, and crack your cheeks! rage! blow! The dinner theater comedy by Don Fried is scheduled to resume Sept. 21 at Wilmington’s TheatreNOW. Four Wilmington theater companies put on plays by William Shakespeare on a regular or semi-regular basis, five if you count the University of North Carolina Wilmington’s Department of Theatre. One of those companies is TheatreNOW, which has grown an audience for its “Shakespeare Brunch” series of staged readings. Perhaps building on that success, TheatreNOW’s latest production is “Shakespeare Inc.,” a farcical comedy written and directed by area resident Don Fried about whether ol’ Bill really wrote all those plays. The comedy is pretty mild, for the most part, but Fried cooks up a conspiracy that’s competently acted and plausible enough to be intriguing, with a rogue’s gallery of well-known, and not-so-well-known, authors teaming up to concoct work under Shakespeare’s name. After having performances on Sept. 14 and 15 canceled due to Hurricane Florence, “Shakespeare Inc.” is scheduled to resume Sept. 21 and run weekends through Oct. 6. Over the years, dozens, maybe even hundreds, of scholars have theorized that any number of people might’ve been the “true” authors of plays attributed to Shakespeare. If you can’t tell the players without a scorecard, make sure to pay attention to the character bios that are projected on the screen above the stage before the show. There’s Christopher Marlowe, a famous author in his own right, and Edward de Vere, a nobleman with a passion for writing who didn’t want his name associated with the lower-class types of the 16th century London theater. More famous names in the mix include Ben Jonson, Francis Bacon and even Queen Elizabeth I, while the lesser-known Mary Sidney Herbert and William Stanley are drawn into Fried’s comic plot as well. The play starts and ends with current-day descendants of Shakespeare, Bacon, et al converging for a kind of theatrical family reunion where descendants of Marlowe and Sidney discover a text laying out the story that unfolds, taking us back to 1591 and London’s Mermaid Tavern. Lacking “pecuniary wherewithal,” a notorious but broke Christopher Marlowe (the deep-voiced Braxton Lathan Williams, compelling) offers to help a doltish young actor named Shaksper (Joshua Drew, convincingly clueless) — later christened Shakespeare for the anonymous, spear-carrying soldier roles he tends to get — shape his appallingly bad story of a boy and his horse, Winnie. Soon enough, Marlowe is drawn into a lucrative scheme with de Vere (a believably worked-up Hal Cosec) and Stanley (Rich Deike, all business) to put out work under a then-unknown Shakespeare’s name. This type of thing has been done before, and frankly better, in Amy Freed’s whip-smart 2001 farce “The Beard of Avon,” which imagined de Vere to be the author of Shakespeare’s plays. But Fried’s approach is thoughtful, if a tad sedate. And while it’s funny when the passionate de Vere tells Marlowe he’s working on a script titled “Controlling an Intemperate Woman,” Fried goes back to the punny well of Shakespearean titles a little too often. The show comes with a Brit-themed meal from TheatreNOW chef Denise Gordon that starts with a nicely creamy cauliflower, carrot and parsnip soup with oyster crackers for added texture.An oven-baked fish and chips was a tasty, and healthier, take on the pub-grub classic, and the beef tips braised in Worcestershire and ale were fantastic. A lentil, apple and roasted veggie pie topped with a massively dry crust round was a promising idea, but largely flavorless. What: “Shakespeare, Inc.” by Don Fried, presented by TheatreNOW. Info: Tickets are $42, includes dinner and show but not beverages or tip. $18-$24 show only. Before the show Fried told the TheatreNOW audience that, in theory, the events of his play could’ve happened. That makes in interesting, but “Shakespeare Inc.” ultimately works better as an intellectual exercise than it does as a comedy. <<In April 2006, a Boeing Delta II rocket launched CloudSat, along with a second satellite, CALIPSO, into space on two- and three-year missions to study the world’s clouds and a mix of airborne particles called aerosols. 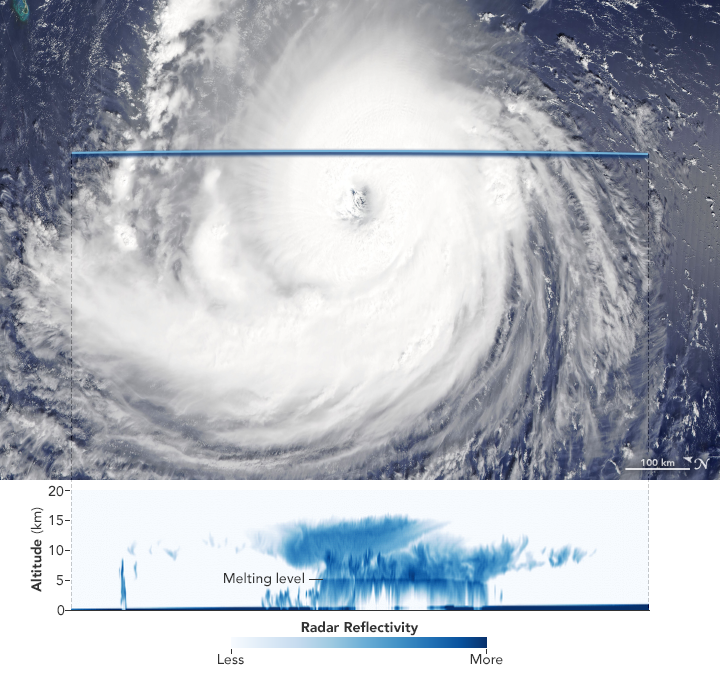 The CloudSat pass offers a unique view of Florence’s asymmetrical structure, the intense convection and rainfall churning inside the storm, and the complex vertical cloud structure that is not visible from above. The storm’s clouds reached an altitude of about 15 kilometers at their highest point—fairly high for a tropical cyclone. In February 2018, CloudSat mission engineers at NASA’s Jet Propulsion Laboratory in Pasadena, California, executed two thrusters burns that lowered the satellite’s orbit out of the A-Train following the loss of one of four reaction wheels, devices that help control the spacecraft’s orientation. The maneuvers lowered CloudSat’s orbit from 705 kilometers above the surface to 688 kilometers. At least Cloudsat won’t be flying alone during its golden years. The scientists and engineers who manage CALIPSO decided to ease that satellite out of the A-Train and into an orbit near CloudSat, making it possible for the two satellites to continue making coincident observations. By late September, CALIPSO will have resumed its familiar position about 4 kilometers ahead of CloudSat, just like the two satellites flew for years as part of the A-Train. After a hot, dry summer, it seems winter might be upon us. Had our first snowfall a couple of days ago- about an inch here, though areas around here got several inches. Not something we've seen in recent years. Last year we didn't even have a frost until the beginning of November. Now we're dropping into the 20s overnight. Just a couple of weeks ago we spent three days riding in the high country, and it was warm even at night at 11,000 feet. Suddenly this. But awfully pretty to have the snow while the aspens are still in their autumn color. We had a huge snowstorm last night, that dropped 10 inches. Not too cold, so it was pretty heavy snow. They canceled school today- on Halloween! We only average a couple of snow days a year (last year we had none) and never before December or January. 25 years living in Colorado, and I've never seen snow like this so early. And last year we hadn't even had a freeze, and I was still finding flowers here and there. Today I had to shovel a few hundred meters of trail between the house and our offices, and plow down to the county road. Sure hoping for more snow. Fun for riding and snowshoeing, and we can use the moisture. All good ideas for the trick-or-treaters in Guffey tonight! What's the altitude there Chris? We're right at 5,000 ft., but several hundred miles north and we're just starting to see a little snow. 9100 feet here at the house, with the local landscape ranging from about 8500 to 11,000 feet. But this storm dumped snow down on the Front Range, as well, as low as 5000 feet. Wow, Chris. Since I hate snow, I'm not envious. Do you mean you had no snowfall at during last winter season (November-March 2017)? I've spent enough time in northern Europe to get why so many of you hate snow. But this is Colorado. It's always sunny. This is us out riding yesterday in that fresh, early snow, with views for miles. How could anybody hate that? Californians certainly don't like the winds but, for the rest of us, they're keeping the skies clearer. Makes you wonder how they start? Winds on Earth start with the uneven distribution of solar heating of the atmosphere. I wish there was hybrid car that could double as a home emergency back-up both battery-wise and generator-wise. Solar panels (or the grid) could recharge its battery for cheap daily driving but, in the event of an emergency, both the car’s battery and its ability to use fossil fuels could serve as a home generator and propel the car when its battery has discharged. Pipe dream Of course it would have to look good and drive itself too. It is all but certain that as the number of electric cars increases, those cars will be used to feed the power grid. That is, when cars are plugged into charging stations, current will be allowed to go either way in order to maintain a stable grid. That feature will be build into cars, and should allow for home charging stations that work the way you suggest, feeding the house rather than the entire grid.